In what will surely be the last sub-par weekend of the year, with the release of Rogue One: A Star Wars Story set to breathe new life into the box office on December 16, Moana managed to come out on top for the third weekend in a row. Only one new release hit theaters this weekend, the outrageous R-rated comedy Office Christmas Party, but it couldn't manage to top the current box office champ, Disney's Moana, which won for the third week in a row with $18.8 million. It was expected that Office Christmas Party wouldn't be too far behind, which was an accurate prediction, with the comedy coming in second place with $17.5 million in second place. Between December 16 and Christmas Day, seven new movies hit theaters in wide release, Rogue One: A Star Wars Story, Collateral Beauty, Assassin's Creed, Sing, Passengers, Why Him? and Fences. Between the upcoming December 9 frame and last weekend, only two new movies arrive in wide releae, Incarnate, which opened in ninth place with $2.6 million and this weekend's sole newcomer, the holiday comedy from Paramount, Office Christmas Party. This weekend will also see an expansion into roughly 1,600 theaters for Miss Sloane, which opened over Thanksgiving in limited release, but it failed to crack the top 10, taking 11th place with $1.9 million from 1,648 theaters, for a paltry $1,153 per-screen average. Two more expanding films did make the top 10 though, with Nocturnal Animals and Manchester-by-the-Sea faring well, while La La Land set a new box office record in limited release. Box Office Mojo reports that the R-rated comedy Office Christmas Party opened in 3,210 theaters with a decent $5,452 per-screen average. It was estimated that the comedy would only open in 2,800 theaters, which is still far less than Moana's 3,875 rollout. Moana dropped almost exactly half of its $56.6 million opening weekend tally last weekend, by coming out on top with $28.2 million, but this weekend, it only dropped 33.4%, with a solid $4,862 per-screen average from 3,875 theaters. Office Christmas Party only cost $45 million to produce, so it will likely fare well throughout its run, barring a steep drop next weekend. 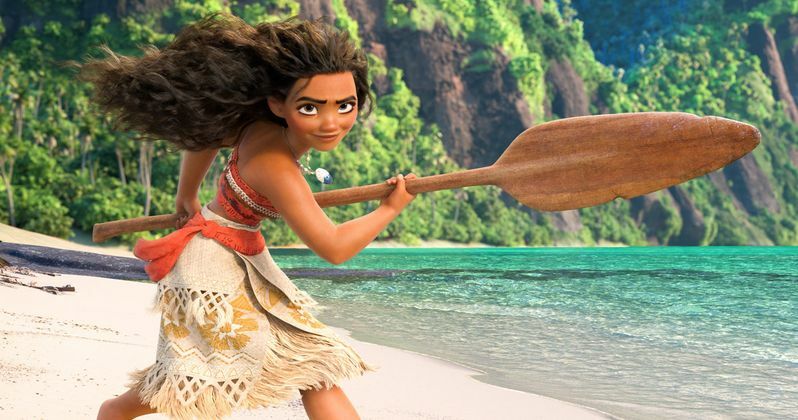 Moana has taken in $145 million domestically through its first thrree weekends in theaters, although it hasn't fared quite as well internationally. The film has only earned $93.8 million in foreign markets for a worldwide total of $238.8 million. Moana is set in the ancient South Pacific world of Oceania, where a born navigator, sets sail in search of a fabled island. During her incredible journey, she teams up with her hero, the legendary demi-god Maui, to traverse the open ocean on an action-packed voyage, encountering enormous sea creatures, breathtaking underworlds and ancient folklore. Dwayne Johnson leads the voice cast as Maui, with newcomer Auli'i Cravalho voicing the title character. The supporting voice cast is rounded out by Alan Tudyk as Heihei, Nicole Scherzinger as Sina and Jemaine Clement as Tamatoa. Miss Sloane is set in the high-stakes world of political power-brokers, Elizabeth Sloane (Jessica Chastain) is the most sought after and formidable lobbyist in D.C. Known equally for her cunning and her track record of success, she has always done whatever is required to win. But when she takes on the most powerful opponent of her career, she finds that winning may come at too high a price. The rest of the top 10 is rounded out by Fantastic Beasts and Where to Find Them in third place with $10.7 million, Arrival in fourth place with $5.6 million and Doctor Strange rounding out the top 5 with $4.6 million. The top 10 will be rounded out by Allied ($4 million), Nocturnal Animals ($3.19 million) Manchester-by-the-Sea ($3.15 million), Trolls ($3.11 million) and Hacksaw Ridge ($2.3 million). In a weekend that didn't make too many waves among wide releases, a limited-release musical may have been the real big winner. Lionsgate debutd critically-acclaimed musical La La Land, starring Emma Stone and Ryan Gosling, in just five theaters, but it came in 15th place with an astounding $855,000, for an incredible $171,000 per-screen average, the best per-screen average of the year. This musical bested Moonlight, whose $100,519 per-screen average in October was previously the best this year. The film will expand to 200 theaters in 40 markets next weekend, with a further expansion set for Christmas Day. No box ofice data was released for Magnolia's documentary Harry Benson: Shoot First, Screen Media's thriller Sugar Mountain, Viva Pictures Distribution's romantic comedy The Bounce Back and Yash Raj's drama Bekfire. The Bounce Back is actually opening in roughly 600 theaters, but that won't likely be enough to have it crack the top 10.